Faculty of Biology UGM has organized guest lecture with outstanding speaker, Prof. Dr. med. Stephan Immenschuh, from the Institut für Transfusionsmedizin Medizinische Hochschule Hannover Germany. 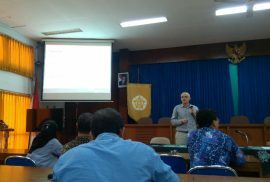 This guest lecture was held on March 6, 2018 with the topic of Stem Cell Role in Research and Clinical Purposes which was attended by students, lecturers, and staffs of Faculty of Biology UGM. This activity has opened by welcoming marks by Dean of Faculty of Biology UGM, Dr. Budi Setiadi Daryono, M.Agr.Sc. The stem cell is an undifferentiated cell population that can renew itself and produce a new generation of highly specialized cells. Stem cell technology known as stem cells has been established since 1965 with the success of bone marrow transplantation in two immunodeficiency siblings. In subsequent years, there was an important event that marked the progress of stem cell technology in the field of clinics. MATALABIOGAMA is one of places to train conservationist and environmental leaders in Indonesia as the Director General of conservation of natural resources and ecosystem of the Ministry of environment and forestry (KSDAE KLHK), Ir. 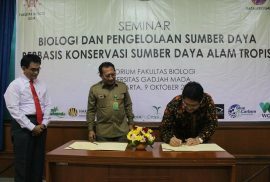 Wiratno, M.Sc., said in a seminar entitled “biology and Conservation-based management of natural resources in Tropical”, in The Auditorium of the Faculty of biology, Monday (9/10). Around 200 world experts present in The 5th International Conference on Biological Science (ICBS) 2017, a conference held by Biology Faculty, from 15 to 16 of September 2017 at East Parck Hotel Yogyakarta. This biannual event is attended by participants from seven countries in the world such as Japan, Sweden, Germany, Netherland, Australia, Malaysia, and Indonesia. Opening remarks has been delivered directly by Rector Prof. IR. Panut Mulyono, M. Eng., D. Eng.